Samario's - Great Old Forge Pizza Outside the Pizza Capital! 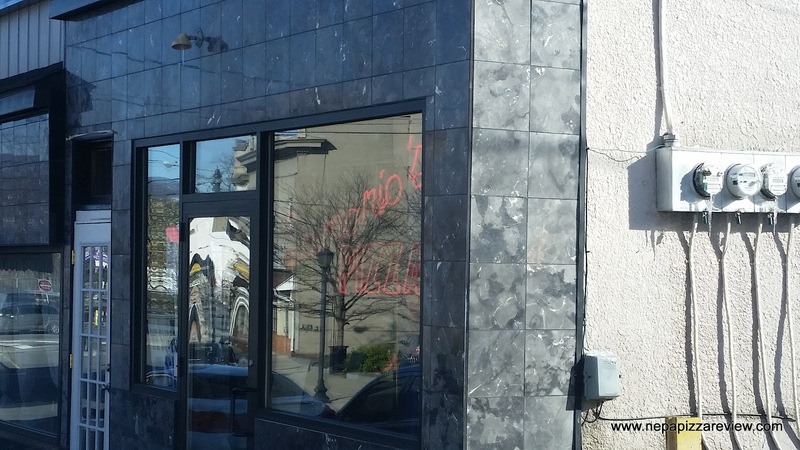 Samario's is a place that I enjoy going to for a nice sit-down dinner, but don't frequently get the pizza there because the food is so good. I've reviewed their Chicago-Style Pizza before, which was both unique and excellent, but have yet to review both their Old Forge or Round pizzas. A friend of mine decided he would bring over a couple of trays for us to feast on. After rudely telling him that he couldn't eat the pizza that he purchased and brought over until I was done photographing them with my cell phone, we quickly dug in. 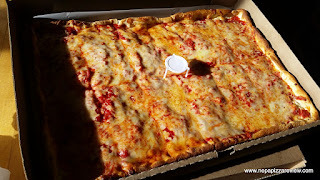 As you may know from my previous reviews, Old Forge Pizza is not my favorite genre, but I do love it for what it is - a tasty treat that has helped put NEPA on the map! After looking over both pizzas and determining that they were probably both comprised of the same ingredients, just in different shapes, I decided to go for the Old Forge first. The smell resonating from the pizza was remarkable, sort of a buttery parmesan scent that was so pleasant and inviting. The first bite was excellent as the flavors and textures of the sauce lead the way. 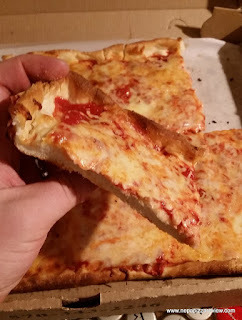 There was plenty of sauce on this pizza, which I appreciated because it was a flavorful and vibrant sauce with some slight chunkiness and consistency - AKA my favorite characteristics of a quality Old Forge sauce. 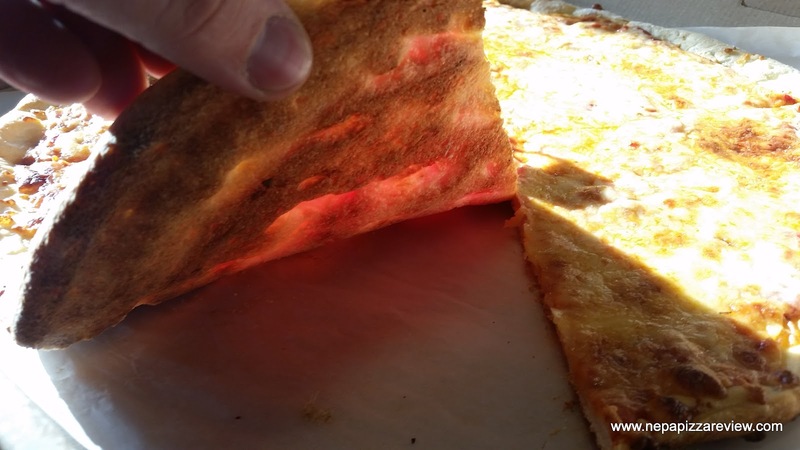 The crust was light, crisp on the bottom, flavorful, and tender and I really enjoyed it. I will also say that the crust maintained its integrity - after sitting for several hours it didn't get soggy or chewy. Finally, the cheese, which was some sort of blend presumably with a little parmesan sprinkled underneath was super tasty and the perfect topper to this excellent pie. The whole thing was fresh and well prepared. I was probably pretty annoying to my buddy who had to hear how impressed I was with the pizza over and over again. I'm guessing the words "Shut up and just let me eat" probably came to his mind at least a dozen times! The round pizza theoretically should have netted the same results presuming that my assertion that they are using the same ingredients is correct, but I had a different experience with this pizza. Just because a pizza has the same components doesn't mean it will result in the same tastes and textures. 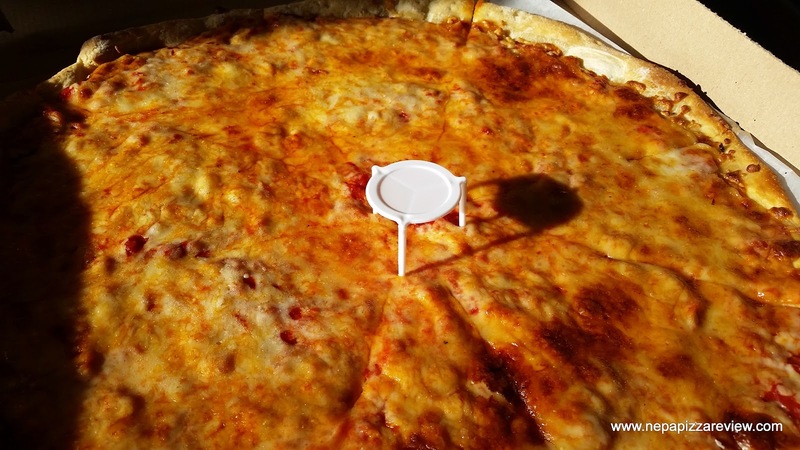 For example, the round crust was hand tossed rather than pressed out into a pan, allowed to raise over time and baked before sauce and cheese is placed on top. The round pie probably went in the oven as raw dough with the cheese and sauce already on top causing a totally different cooking process and interaction between the ingredients. There was also less sauce applied to this pizza, making it a bit drier. The crust was a little tougher on the round, but still pretty good. 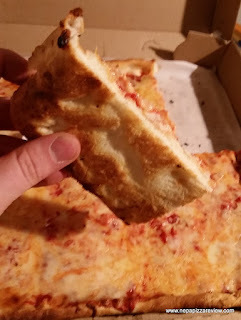 The cheese was also the same, but seemed a bit flatter in appearance and flavor when compared to the old forge pizza which had distinct layers and sensations. I did enjoy the round pizza as well, but not nearly as much as the Old Forge pizza which was among the top 2 or 3 Old Forge pizzas I've ever had in my lifetime. Overall, I would highly recommend the square tray from Samario's any day of the week. 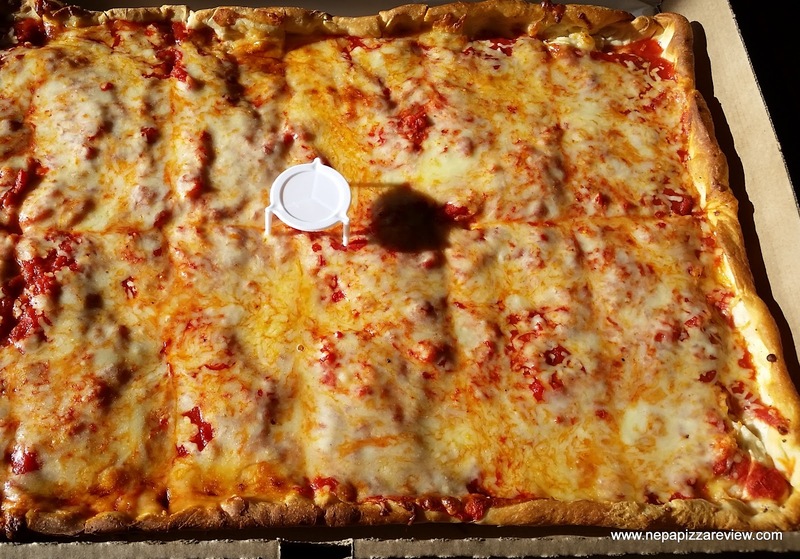 Just because this place is located outside of the borough of Old Forge doesn't mean you can't get a first class Old Forge Pizza there! 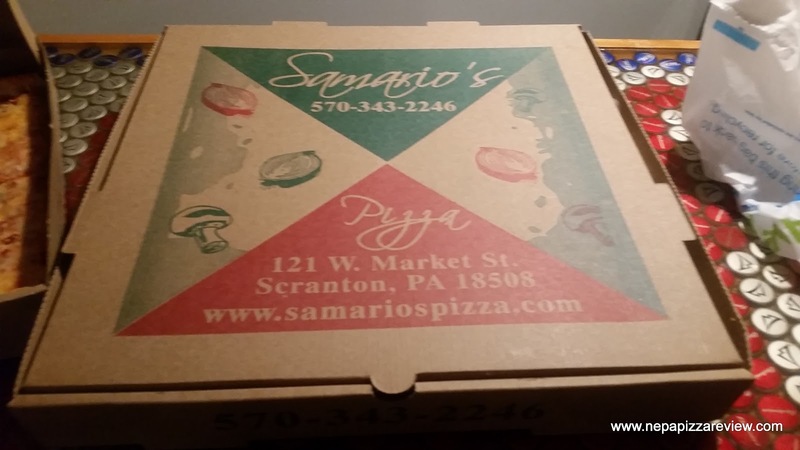 If you haven't been to Samario's, I'd highly recommend you add it to your short list of restaurants to try, even if it's not for the crazy good old forge pizza you owe it to yourself to try the food! That's why I named it to the Top Pizza Places in NEPA for a Romantic Date!